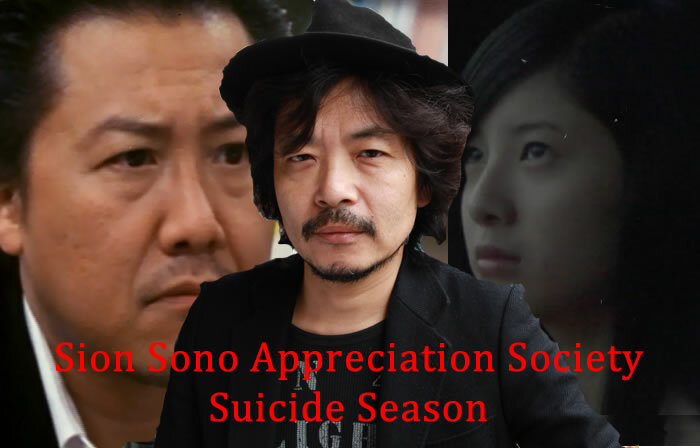 Regular readers of this blog will be more than aware of the fact that I like the films of Sion Sono. Earlier this year I had a season of reviews for his films in the run-up to the UK premiere of Himizu. I left off a major title, Suicide Circle, because I had yet to get its prequel Noriko’s Dinner Table but I recently rectified that by purchasing it. So this week there will be another season dedicated to him with lengthy (potentially boring?) interpretations/reviews of Suicide Circle and Noriko’s Dinner Table. I’m not alone in this endeavour because Goregirl will be bringing her considerable opinion to the table when we discuss Sono’s films in a number of podcasts. In other movie news… I have the honour of being this week’s participant in the My Movie Influence strand over at Inspired Ground. I won’t spoil the surprise as to which movie I picked (you will never be able to guess it) so head on over and check it out. My thanks go out to Andina! Anyway, brace yourself for some gore and existential angst for the next week and a bit as we dig into some more Sono films. Good choice with your movie influence being Chungking Express! Thanks! It’s such a great movie and such an inspiration. I’m lucky that I was the one who got to write about it! Hmm. I just realised I really know just about nothing about Sono Sion (having watched only Himizu). As for your movie influence (I won’t name it), I haven’t watched that yet either. I couldn’t think of a ‘movie influence’ to pick. Were you already watching J-films then when you watch that ‘movie influence’? Sono has dabbled in a wide variety of genres but I prefer his darker material. For me Suicide Circle and Noriko’s Dinner Table are two of his best… I’ll get into that with the reviews. As for the movie influence… the secret is out! When I watched that ‘movie influence’ I was heavily into Japanese films and anime already. I like your movie influence pick, and honestly I’ve been wanting to see that movie ever since I started blogging. It’s a great film and I hope the article has inspired you to watch it soon! Perhaps you know about this but SION SONO EARLY WORKS: BEFORE SUICIDE DVD collection will be released on Oct. 2 in JAPAN. 13 titles (8 are never been released titles). I’m not sure if there’s going to be any English subs included. Amazon Japan already has it up on their website for pre-orders. Aaww man! Thanks for the information. 🙂 I’m going to pre-order that collection. I’ll worry about the lack of English subs later because this is the type of collection that won’t hit the west.